Rolls-Royce Limelight Collection is a beautiful, discreet motor car in which those for whom the world is waiting can prepare, relax and arrive in the finest luxury and style. The Rolls-Royce Phantom Limelight Collection has been conceived for that select group of people who spend their lives in the public eye and on the world stage. Its name was inspired by the origin of a British invention which became synonymous with fame. The limelight effect was originally discovered in the 1820s by Sir Goldsworthy Gurney, a prototypical British gentleman scientist and inventor of the Victorian era. It was harnessed to revolutionise illumination in the theatres of London’s Covent Garden, highlighting leading actors on the stage, thus leading to the phrase, ‘in the limelight’. “In creating the Rolls-Royce Phantom Limelight Collection, our designers have delivered authentic luxury by thinking deeply about the lifestyles of the powerful people who operate in the public eye and move swiftly from engagement to engagement as part of their daily life. The result is a beautiful, discreet motor car in which those for whom the world is waiting can prepare, relax and arrive in the finest luxury and style.” explains Torsten Müller-Ötvös, Chief Executive Officer of Rolls-Royce Motor Cars. Authentic luxury is only achieved through ultimately understanding the needs and desires of the most discerning patrons in the world – Rolls-Royce customers. From their deep understanding of this specific group of super-luxury clients, the Bespoke design team behind Limelight understood that a number of very human emotions and needs mattered: easy access to one’s favourite, personal possessions in order to prepare for the coming engagement; the opportunity to relax in ultimate luxury once ready and an impactful arrival. For these select people, Phantom Limelight is their very personal concept of authentic luxury. The fragrance bottles, which ensure the passenger always has the right fragrance available to them whatever the time of day, are handmade in the famous Bresle Valley in North West France – home to 75% of the world’s luxury bottles for perfumes and spirits. 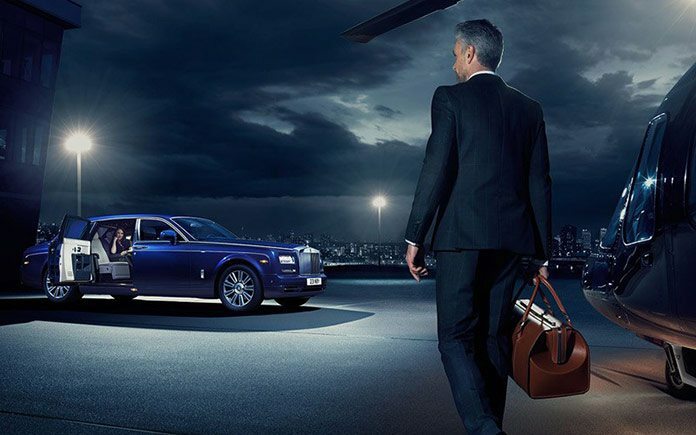 Prepared and relaxed, the Rolls-Royce Limelight Collection’s passengers arrive for their next engagement clad in the rich but stealthy Gala Blue of Phantom Limelight. Rolling to a halt on its unique nine-spoke alloy wheels, the beautiful motor car features a Seashell and Navy Blue hand-painted coachline with a diamond motif, creating a three dimensional illusion of a diamond bracelet draped over the surface of the car.